One of the worst parts of shopping for awkward friends and family is finding something they’ll love that’s original too. We get lots of tweets asking us for ideas for great places to buy a unique gift – and at the start of this year we were provided with the perfect answer. Handmade Hall is occupying a large space in the newly revitalised Grand Arcade and hosts a range of cafes and shops with a unique approach to shopping. At the top of the stairs you’ll find a daring little shop with a brilliant range of beautiful knick-knacks, prints and homewares. It’s name is Eek! Eek! 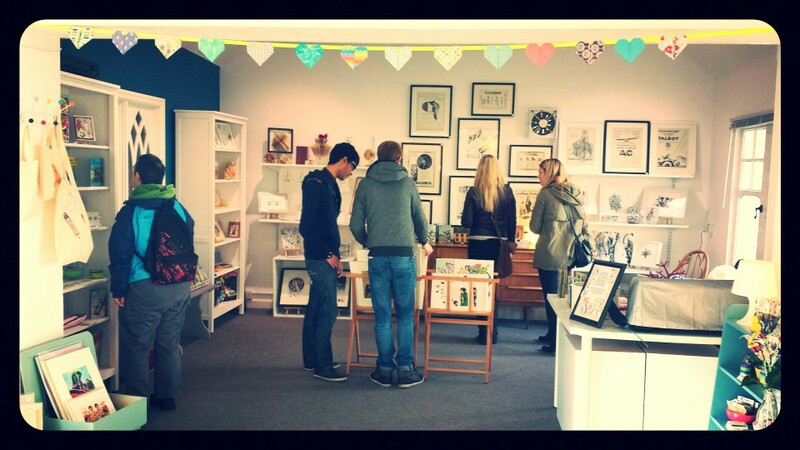 is a unique destination for print and illustration situated on the first floor of Handpicked Hall in the Grand Arcade. We sell various goods, from vintage ladybird books and origami paper vases, to plush badges and illustrated jewellery to vintage prints and a wonderful range of illustrations. Eek! was formed following the success of a smaller shop run by Jil, Alice and Chloe. Jil wanted to create a special place for fans of print and particularly illustration. So, Eek! was born on one cold January day, with plenty of hard work, visual merchandising and hand picking! We have selected the very best of local designers, giving them a chance to have high street presence in our relaxing environment. We love our shop and it’s original Victorian features, which teamed up with our layout, furniture and awesome products has made people say ‘wow, can I come live here?’ We’ve come so far in just a few weeks and intend to grow even more. What can customers expect from Eek!? Our customers can expect great customer service, a fresh and innovative approach to print and illustration, a variety of products. We love the reactions people have when they walk into Eek! and discover our products. When people think of illustration, they probably imagine a flat piece of paper, well, we have everything. We have 3D plush mixtapes and badges by Jil Made This, stunning notebooks and patterned cushions by Hayley Louise Crann, giclee prints and custard cream tea towels by Simon Lewis, origami and hand cut printed paper vases and flowers by Life’s Big Canvas, illustrated earrings by Red Paper House, stunning French art deco prints by The Deco Press, super cute cards by Mister Charlesworth, black and white graphics from Jenny Callan. We’ll be adding more to the mix in March too, so there’s a really wide variety on offer. What does Eek! offer that other places in Leeds don’t? Eek! offers a unique, hand picked hub for print and illustrators in a stunning Victorian building in the historic Grand Arcade. We have expert advice, designers who each have speciality areas, be it their knowledge of printing, commissioned pieces, retail background, or vintage goods. We’d like to think we can help every customer. We’ve created a space with lots of things to discover, plenty of colour and design quirks! What’s your favourite item on sale? My personal favourite is probably Red Paper House’s awesome illustrated jewellery, which starts at just 6. It’s not like other jewellery and has a beautifully handmade and natural feel with great colours. What are your bestsellers so far? Ooh that’s a tough one! All of our products sell well, but I would say our range of greetings cards are most popular, from rainbow horses and custard creams to art deco and origami, there’s a card for anyone and all with a handmade and printed twist. The people, the places and the events, it’s multicultural, eclectic, with plenty to discover! I like that Leeds grows in so many different directions, but remains grounded. Where do you like to hang out apart from the Eek! shop? Handpicked Hall is a fantastic place to hang out for food, drink, shopping and more. We like to take a spot of tea at our neighbours Just Grand! tearooms or a cup of coffee downstairs at Cafe Colombiana. We also love Mrs Athas, Mojo, and places with good music.